The Kalamazoo area is experiencing some cold and windy weather. Even though we have blue skies and sunshine, the night time temperatures are in the 20’s and wind chill is in the teens at best. Rebecca has been hunched over the eggs for several days almost nonstop. There should be another egg coming soon, but it is hard to tell how many there are when the adults need to keep them warm. 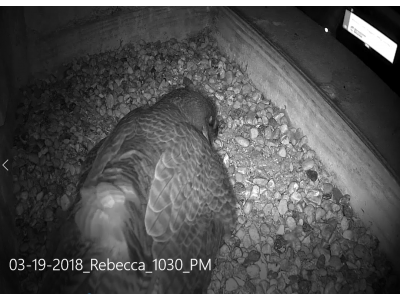 There is a video clip of Rebecca on a very windy night (3/19) in the nest box. She is such a great mother.